It’s the Merdeka (Independance) Weekend as Malaysia celebrates its 50th Year of Independance. This post is queued to publishing on the 31st August, 2007 to coincide with National Day and it is a food review of Encik Rosli’s Mee Rebus which is one of the better Mee Rebus I have eaten. Rosli Mee Rebus is located behind Wisma Haniffa, off Jalan Masjid India in downtown Kuala Lumpur. Set somewhere in the middle of a row of street hawkers is Rosli Mee Rebus, with its distinguishing green coloured signboard. 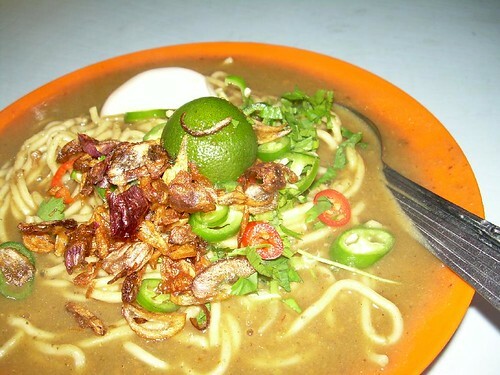 Encik Rosli has been cooking and selling Mee Rebus for more than 30 years. A Malaccan by birth, his growing up years was in Singapore when his father was then posted there in the military. As he started work, he became an apprentice to a Javanese hawker who sold Mee Rebus in Singapore. However, he did not manage to learn the recipe despite working with the Javanese for 8 years until the Javanese’s retirement at the age of 78. He moved to Kuala Lumpur in the late 60s and was operating behind Selangor Emporium (which has since closed down) until 1998 when he was asked by the authorities to locate to this present spot together with other hawkers. Business starts at about 9.00am in the morning till 5.00pm in the afternoon from Mondays to Sundays and I was the first customer today. In fact, I had to wait for about 10 minutes whilst he was cooking and heating up the Mee Rebus gravy. That gave me a chance to chit chat with the friendly Encik Rosli and hence, you got the historical fact above. Rosli Mee Rebus is truly delicious. The yellow noodles are blanched just nice and come without the alkaline taste associated with yellow noodles. It is also soft enough to be slurped into the mouth, if you are into that kind of food eating experience. Freshly blanched bean sprouts are also included. The gravy is well worth a try. Made of secret ingredients (of course) which includes peanuts and spices, the gravy tasted sweetish with an ever slight spicy hot hint to it. The Mee Rebus is topped with freshly cut chillis, fried shallots and half a hardboiled egg. Half a fresh lime is included for you to squeeze out the juice to make the Mee Rebus extra delicious. If you want to, you can ask for fried tofu for at an additional cost. According to Encik Rosli, the original recipe he inherited from the Javanese cook has beef as part of the ingredients. However, to suit his customer, he has omitted it from the recipe. Encik Rosli informed me that he also caters to functions on Sundays and has quite a regular clientele. I won’t be surprised considering that he’s been selling this longer than I’ve been born. I am now one of his regulars and it is no wonder why when he keeps delivering good Mee Rebus all these years. That shallots, green chili, and that lime in the gravy…just makes mee rebus sooooo good! I am not that familiar with the surrounding areas of Jln Masjid India…could you share with me the directions to get there or some landmarks that I could identify? Would love to try the mee rebus cos it looks real good. tigerfish : It IS good! BN : Depending. I would recommend taking the LRT and get off at Masjid Jamek Station. Next to Masjid Jamek Station is Jalan Melayu. Walk along Jalan Melayu till you see some pedestrian street stalls. Enter that street and continue walking to the end. You will now come to the beginning part of Jalan Masjid India. Walk down the road for about 300 metres or so. Wisma Haniffa (which houses the Haniffa Textiles store) is on your right. 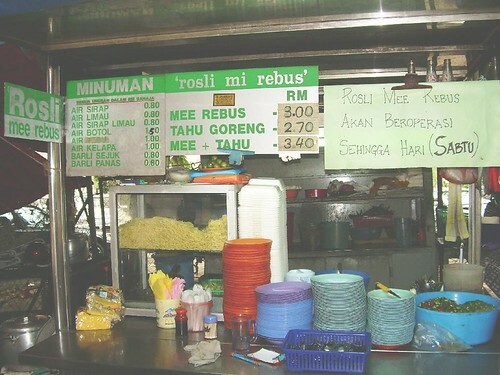 Rosli Mee Rebus is located in a backlane behind Wisma Haniffa. Thanks for the direction 🙂 Will try it over one of the weekends! BN : Bon appetit! It’s closed on Sundays and yesterday being the 1st day of Ramadhan, it was closed. Rosli : I haven’t tried out the ones in BP. Have you? For the life of me.. i’ve never liked mee rebus.. ! strange eh..?? This Mee rebus really delicious ! i had tasted it so many times ! It’s the best in town ! Try it!